Sleep apnea (AP-ne-ah) is a common disorder in which you have one or more pauses in breathing or shallow breaths while you sleep. These pauses in breathing cause you to move from a deep sleep to a lighter sleep. This disturbance causes you to wake feeling unrested. Sleep apnea is the leading cause of daytime drowsiness. Sleep apnea is usually detected by a family member or bed partner, it can only be determined by doing a sleep study. Untreated sleep apnea can increase the risk of high blood pressure, heart attack, stroke, obesity, and diabetes. It also increases the risk of, or worsens, heart failure, and makes arrhythmias (irregular heartbeats) more likely. Treatments for sleep apnea include lifestyle changes, oral appliances, breathing devices, and surgery. 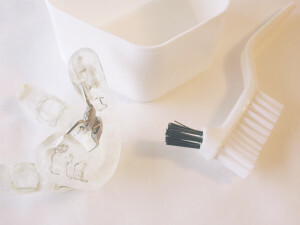 Oral appliances are recommended for mild to moderate cases of sleep apnea because they are less cumbersome and uncomfortable than most breathing devices. Overnight sleep studies, CPAP, BiPAP, and Oral Appliance Therapy are all frequently covered by most medical insurance plans, including Medicare. What should you do if you think you may have sleep apnea? Call our office and schedule an appointment for a consultation with Dr. Westover. Bring your medical insurance card to your appointment. If you have had a sleep study, bring it with you. If not, we can help you schedule a sleep study. We will get pre-approval from your insurance company to determine how much your co-pay will be. Once approved, come back to our office for impressions. Enjoy a good night’s sleep with your new oral appliance. Information provided by the National Heart, Lung, and Blood Institute.